In the world of low-powered tube amplifiers, there continues to be a need for high-efficiency loudspeakers. Many people think the best sounding speakers for low-powered, single-ended triode (SET) amps use full-range, single driver designs without an electronic crossover. Most such designs use horn-loading to achieve adequate low-bass. However, while horn-loading may contribute greatly to efficiency, it often adds a characteristic coloration of its own. In the recent past, low-powered, SET amps commanded a very high price. Those who could afford them usually purchased high efficiency loudspeakers such as those using an expensive, horn-loaded cabinet built around a Lowther driver. While such designs often resulted in remarkable audio performance, they also carried frighteningly high price tags. In the last few years, affordable SET amplifiers have created a demand for lower-priced (under $1,000), tube-friendly designs. Speakers in this class include the new Loth-X Ion series, the Hornshoppe Horn speakers, and the Moth Audio Cicadas, the subject of this review. The Cicada uses a full-range, single-driver in a bass-reflex cabinet. The driver is a custom-designed, 7 1/2-inch (16cm), full-range driver with a whizzer cone that is made from stiff, lightweight, white paper. The driver, which looks outwardly similar to a Lowther driver, has a higher Qts than a Lowther allowing reasonable efficiency with a ported enclosure. The Cicada is rated at 94dB/1W/1M, efficient enough for almost any 2A3 or 300B SET amplifier. While this is not as efficient as most Lowther-based speakers, use of a bass-reflex cabinet reduces manufacturing costs substantially. The driver has a free air resonance of 50Hz, which, combined with the ported cabinet design, results in a rated frequency range of 60Hz to 18KHz. The cabinet is made of MDF and measures 33cm wide, by 30cm deep, by 104cm high (13" x 12" x 41"). It is a tall, small-footprint, floor-standing speaker that weighs 18kg (40 lbs). Moth includes a set of four tip-toe inserts, which enhance stability and sound quality when the speaker is placed on a carpeted surface. 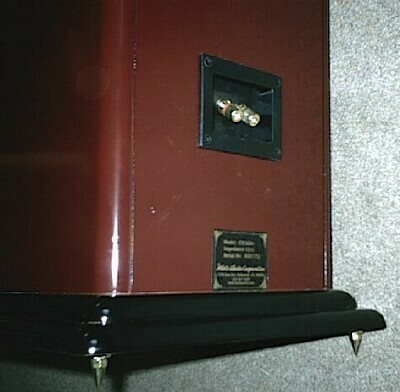 A pair of 4-way binding posts mounted in speaker cups are located on the lower back side of the cabinet. Moth Audio enhanced the aesthetics of the floorstanding cabinet design by rounding all edges and corners, by including a recessed, 2mm line on each side, both of which are visible from the front and top, and by adding a wide base made from two pieces of MDF rounded to match the style of the remainder of the cabinet. The tuned port is located on the front of the cabinet. The port lies behind an antique-style grill, which is cut from the cabinet. The Cicada cabinet is coated with an evenly and well-applied paint finish. The sample units were a an antique brownish-red with a black base. Although the Moth Audio Cicada is a thoroughly modern design, the overall visual effect is that of a large radio or speaker from the 1930's. A fairly large, intricate Moth emblem is located on the front of the cabinet beneath the driver. The emblem is based on a large and exquisitely beautiful, California sphinx moth. Craig Uthus, president of Moth Audio, is responsible for audio and electronic design of Moth products. Joel Marshall, art director for Moth, has created the look of the company's products, including the Cicada loudspeaker, and has designed Moth's products to complement each other. Like most well-made, full-range, single-driver loudspeakers, the Cicadas reproduce music with an honest, natural presentation that belies their modest specifications. The rated frequency response of only 60Hz to 18KHz may give the impression that the Cicadas could not perform properly because they lack sufficient lows and highs. People who judge the quality of an audio product simply by the specifications and measurements will be very surprised, because nothing could be further from the truth. The Cicadas sound very balanced and neutral, with one notable exception - there is a spike in sound level at about 10KHz. This spike can cause a slightly 'tizzy' sound that, under some circumstances, can detract from the listening experience. However, this minor problem easily can be remedied by proper speaker positioning relative to the listener. Bass is full and surprisingly deep, with a useful range slightly lower than the rated 60Hz in my listening environment. Mids are neither forward, nor laid back, but present acoustical and vocal sounds in a very honest and appealing manner. Highs sound clear and natural, with the exception of the aforementioned tizz from improperly positioned speakers. The most laudable quality of the Cicada is its natural, honest, and very musical presentation. Rhythm and timing sound spot on; this seems to be a characteristic of most single-driver loudspeakers. In addition to the excellent timing of the Cicada is a mid-frequency presentation that is difficult to improve regardless of speaker cost. In the all-important mids, the Cicada simply gets it right. Tonal quality is superb, mid-range transients are excellent, and there are no noticeable colorations that get in the way of the music. Musical inflections, from the slight bending of a guitar string to changes in a piano damper pedal are so obvious and clear, the question becomes, "why aren't these sounds as apparent with other speakers?" Nuances of feeling that are missed by most speakers in the same price class are expressed clearly by the Cicadas. A work of great feeling, such as Stefania de Kenessey's Shades of Light, Shades of Dark has nearly the impact of hearing it live. From the ebullience of Dave Brubeck's Take Five to the melancholy dirge of John William's theme from Schindler's List, the Cicadas deliver music to the listener complete with its intended emotional impact. Of course, one of the most effective musical instruments for delivering emotions to the listener is the human voice, an instrument that is 'played' primarily within the mid-frequencies. Emotional undercurrents of vocal performances are brought to the forefront in a way that most speakers, regardless of price, cannot emulate. Vocals sound pure, rich, and natural. There is no significant coloration of human voices, which is a notoriously difficult achievement for loudspeakers. Linda Ronstadt's What's New LP, provided an opportunity to hear the Cicadas at their best. All the emotional nuances of her performance were clearly reproduced by the Cicadas. A guest listener, who knew of Linda Ronstadt only from her popular music, was shocked and amazed at the quality and depth of her performance, and he was equally amazed by the Cicadas ability to reproduce it with so much of the performance intact. Male vocals sound just as convincing as female vocals. Listening to John Gary is always a remarkable experience, and the Cicadas highlight his superb voice and powerful performances. While not as impressive as the mid-frequency performance, high frequencies generally sound clean and clear. Relatively pure tones, such as a ringing bell, are rendered with beautiful clarity and precision. Unlike some speakers, there is no significant distortion of such tones. The Moth Audio Cicadas handle high frequency transients with ease, accurately and convincingly reproducing sounds like the strike of a stick on a cymbal. The 7-inch driver produces strong, full bass with accurate timing and natural-sounding rhythm. Bass extension was observed below 60Hz in my listening room, which is quite an accomplishment considering problems I have had with some speakers in that room. The lightweight, paper driver is surprisingly effective at reproducing bass transients, particularly for one as large as 7-inches. Detail in the low range was quite good. In fact, when using a BV Audio PA300 solid state power amp, low frequency detail behind the walking bass in the Herb Ellis, Joe Pass Seven, Come Eleven (HiRes Music DVD format) was surprising in that it previously wasn't noticed on other loudspeakers. The Cicadas have reasonably good dynamic range and work quite well with most classical music. When playing music with wide dynamic range, diminuendos are audible and accurate, and crescendos are allowed to nearly reach expected volume levels. While not outstanding in this regard, the Cicadas do a creditable job of allowing enough dynamic range to satisfy the needs of most music. There is a natural tendency to compare the Cicada to a Lowther-based loudspeaker due to the similar appearance of the drivers. However, Lowther drivers come in a wide variety, and no two types sound alike. In addition, Lowthers need to be placed in horn-loaded cabinets in order to attain adequate bass response. If one compares all aspects of the Cicadas to the performance of good Lowther speakers, the Cicada cannot quite measure up. Still, one of the most favorable aspects of a high quality, Lowther-based speaker, such as a Rethm, is the shear impact and presence of the music. The Moth Audio Cicadas accomplish this feat easily, resulting in a loudspeaker that is wonderfully involving. 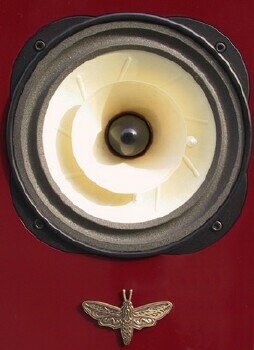 However, when attempting to compare the Cicada and any Lowther-based speaker, one thing must be kept in mind: first, consider that a pair of Cicada loudspeakers costs less than most Lowther drivers without cabinets, then it is easy to see that if such a favorable comparison can be made at all, it speaks very well for Moth Audio's first speakers. They are truly a bargain for anyone that favors music over HiFi. When comparing the Cicada to its closest rival in terms of price and sound quality, the Hornshoppe Horn, one aspect becomes abundantly clear - the Cicadas are much more forgiving of speaker and listener placement than are the Horns. While toe-out of the Cicadas is crucial for good sound, distance from the back wall, side walls, and corners are not as critical. By contrast, the Horn must be tinkered with, moved, tried, and moved again before the correct place is found. Because the Cicadas are bass-reflex rather than horn-loaded, they are much more forgiving and easier to place. There is no "better" speaker between the two, each has its own strengths and weaknesses. An audio enthusiast must research which would likely work better in their listening environment. Quality of construction is excellent. The Cicada is very well made with a solid cabinet and excellent finish. The design is aesthetically striking; most people who saw the Cicadas liked the overall appearance. There were several comments on the "retro" appearance, or how much like a 60-year-old radio they look. Interestingly, the visual aesthetics of the Cicadas fit perfectly with a Mapletree Audio Octal 6 preamplifier with which I was also working. The two looked as though they were designed to visually complement each other. The Cicadas have an odd "tizz" sound in the upper end that seems to be related to the whizzer cones. Lowther drivers are infamous for an odd sound in the upper mid-range that is sometimes described as "shouting". While the tizz is audible, it is neither as intrusive nor as annoying as the Lowther "shout". When I originally heard the Cicadas at the Moth Audio facility in Hollywood, Craig Uthus pointed out the spike in sound level at about 10KHz. If the speakers are toed-in so the drivers are pointed at the listening position, the tizz can be distracting. However, proper arrangement of the speakers, in this case with a very slight toe-out, controlled the tizz at the listener's position. Another solution to the upper end spike is the installation of an inductor into the signal path. Craig supplied a pair of Solen .27mh inductors to experiment with during the review. The inductors smoothed out the tizz, allowing the listener to move around in the room without having the tizz reinforced by an unfortunate acoustic location. The inductors provided a neat solution to the tizz for casual listening. However, the inductor also seemed to smooth out some detail, resulting in a slight veiling of the music. In addition, the upper end seemed a little rolled off, reducing the impact of the high end dynamics. For background music or other, less than serious uses, the inductors would seem to be an excellent addition. But for serious listening, the inductors need to be removed and the speakers positioned with proper toe-out. Craig Uthus is considering installing the inductors on all subsequent Cicadas with a switch that allows removal from the signal path. This sounds like an excellent idea. Despite the depth of bass and the level of low-frequency detail observed, the Cicada sometimes gives the impression of having a slightly soft bass response, perhaps lacking a little of the expected visceral impact. Most of the time this was not noticed and was not a problem. However, with some rock music, the Cicada bass lacks the power to deliver what is expected. The Cicadas are simply not as well suited for the percussion demands of rock music as some other speakers. In fairness to the Cicadas, most people who purchase single-ended triode amplifiers and single-driver speakers are not planning to use them primarily for rock music. Soundstaging of the Cicada is good, but not exceptional. A pair of Cicadas presents a reasonably wide soundstage, but it does not give the illusion of great depth. Holographic imaging is only fair. While instruments are generally well separated, there is little 'air' around them. In my listening room, the focus of the sound seemed to be about 15cm below the level of the drivers. I changed the position of the cabinets several times to try to refocus the sound. This was not really a problem, it was simply an observation. While listening to the Cicadas at the Moth Audio facility in Hollywood, this characteristic was not noticed. As such, it is probably an odd, sonic artifact of my listening room when using these speakers. Of course, it must be remembered that soundstaging and holographic imaging may be fun HiFi stereo effects, but they have little impact on the musical quality of the sound. The Moth Audio Cicada has a rated efficiency of 94dB and a nominal impedance of 12ohms. While this speaker worked superbly with three tube amps, ranging from a 2A3 stereo amp to an old Dynaco ST70, and acceptably well with a 110-wpc solid state amp, the Moth Audio Cicada was a poor match for a Decware Zen SE84C-Select. As soon as the sound came up, the problem was glaringly apparent. The Zen amp was unable to deal with the 12ohm load, giving an overly bright presentation and no bass. The SE84C-S, rated at 1.8wpc and with only an 8-ohm tap, clearly is insufficient for this speaker. Potential purchasers need to be certain their amplifier will work acceptably with a 12 Ohm load. Most amplifiers will. While the Cicada was remarkably musical and very involving with tube amps, its performance with solid state amplifiers was less enjoyable. The peak in the high end of the Cicada seemed to be exacerbated by the sharper high end of the solid state amps. The solution for acceptable listening was installation of the inductors. While this didn't cure it completely, it changed the character of the sound from overly bright and potentially fatiguing, to acceptable. The Moth Audio Cicadas can be used effectively with good quality solid state amplifiers, but almost certainly, they will not be acceptable with inexpensive, mass-market receivers. The Cicada has a large, paper whizzer cone that extends beyond the limits of the cabinet. It is all too easy to brush accidentally against the whizzer. The resultant sound is frighteningly loud (as it is amplified by the cabinet). Fortunately, there was no damage done. The driver is quite vulnerable, and there is no grill available to protect it, even during moving. This is not the speaker to have in a household with inquisitive toddlers. The Moth Audio Cicada has been designed to provide audiophiles with limited budgets an opportunity to experience excellent musical presentation in an attractive and affordable package. To this end, Moth Audio has succeeded admirably and produced a loudspeaker that is very musical and tremendously involving. A higher compliment cannot be paid to any audio product. The Cicada has been voiced to work best with low-powered, SET amplifiers. Moth Audio builds and markets a selection of SET amplifiers suitable for powering the Cicadas. This speaker also sounds very good with push-pull tube amps - my 40-year-old Dynaco ST70 never sounded better. The Cicada even works acceptably with good quality solid state amps, although there are, no doubt, more compatible speakers to use with solid state. Recordings of vocals and acoustical instrumentals sound incredibly lifelike with most of the power and emotion of the performance accurately reproduced. This is far more than can be said of most loudspeakers, particularly those in the price range of the Cicadas. The Cicada is not without its weaknesses. The highs only reach to about 18KHz, there often is a noticeable "tizz" sound resulting from a spike in sound level at about 10KHz, the lows barely reach below 60Hz, and the bass occasionally sounds a bit soft, lacking the power necessary to accurately reproduce certain types music. In addition, holographic imaging is not very effective. In short, if you wish to demonstrate the "HiFi" capabilities of your system, the Moth Audio Cicadas simply will not be appropriate. The most remarkable aspect of the Cicadas is that, despite their limits, they do one thing superbly - they reproduce music with an amazing degree of musicality and emotional content, characteristics which are unmeasurable and often are missing from the "newest" HiFi equipment. If your priority is listening to music instead of HiFi, if you do not have thousands of dollars to spend on speakers, and, if you use relatively low-powered vacuum tube equipment, the Cicadas should be on your short list of affordable speakers worth considering - and it should be a very short list. Some photographs used in this review were obtained from Moth Audio Corporation. Many thanks to Craig Uthus, president of Moth Audio for providing background information and the units used in this review.